Article: Turning your burger up a notch by adding sweet potato fries and a creamy yogurt dip on the side does more than simply tantalize your taste buds. Apart from being one of nature’s supreme sources of beta-carotene, the humble sweet potato also packs a punch of nutrition and some surprising health benefits in every yummy mouthful. Sweet potatoes contain a rich source of orange carotenoid pigments. In African countries, India and in the Caribbean, sweet potatoes are a highly effective way of providing school age children with large amounts of daily vitamin A. Carotenoids are thought to lessen the risk of disease, particularly certain cancers and eye diseases according to a Human Nutrition Research study for the aging. In some studies, sweet potatoes have proven to be an even better source of bioavailable beta-carotene than green leafy vegetables, suggests WHFoods. And since sweet potatoes are available in North American countries on a year-round basis, they can continually provide us with beta-carotene, making them a standout antioxidant food. As sweet as they are, you would think that these orange-hued spuds have a high glycemic index. But in fact, they actually have a low glycemic index, meaning they release sugar slowly into the bloodstream. Unlike other starchy foods that elevate blood sugar rapidly once they’re consumed, sweet potatoes actually help steady the level of blood sugar, which means you won’t get a blood sugar spikes. But what you will get is a steady flow of energy, says San Diego-based nutritionist Laura Flores for Live Science. This regulation occurs even in people with type 2 diabetes. Sweet potatoes are also a great source of vitamin B6, which breaks down homocysteine — a substance that contributes to the hardening of blood vessels and arteries, according to the Harvard University School of Public Health. In addition, the potassium found in sweet potatoes is an electrolyte known to regulate the heartbeat, and it lowers blood pressure by maintaining fluid balance, suggests the American Heart Association. If you’re suffering from stomach ulcers then sweet potatoes may be your go-to food of choice. A study published in Functional Foods in Health and Disease 2012 concluded that the anti-ulcer activity of sweet potatoes is very effective for helping heal ulcers. And not just any type of ulcers — peptic ulcers! Peptic ulcers start as heartburn and then progressively get worse. 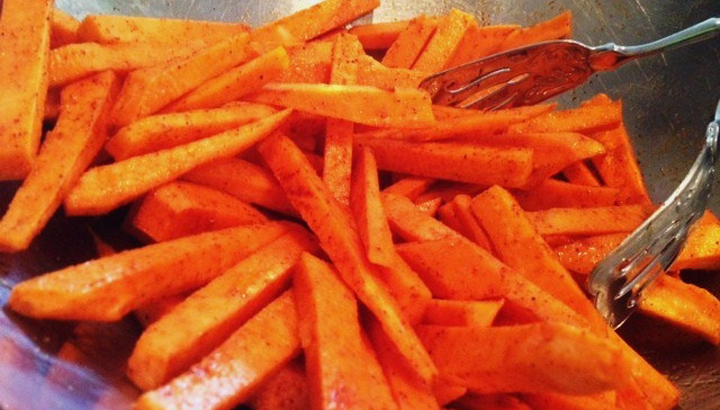 Sweet potatoes soothe the stomach and the intestines. And the B-complex vitamins, vitamin C, beta-carotene, potassium and calcium are all highly effective in helping heal stomach ulcers. Additionally, the roughage that sweet potatoes provide helps prevent constipation and acid formation. Plus, their anti-inflammatory properties help reduce the pain and inflammation associated with ulcers. So, what more do you need to know — except the recipe of course. Preheat your oven to 450 °F. In a small bowl mix all of the spices and sea salt together. 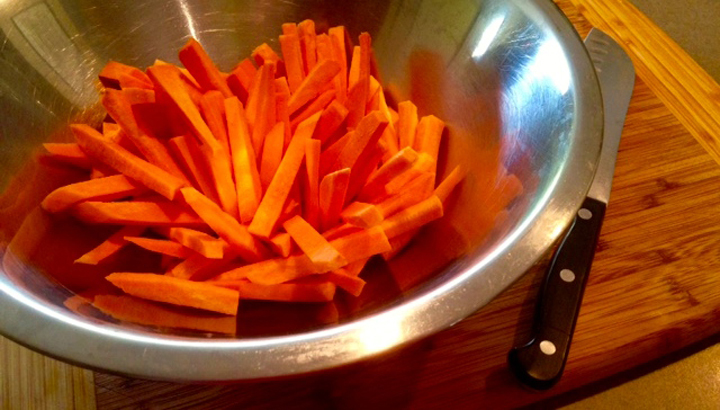 In a large bowl, toss the sweet potato sticks with half of the seasoning mix and the olive oil. 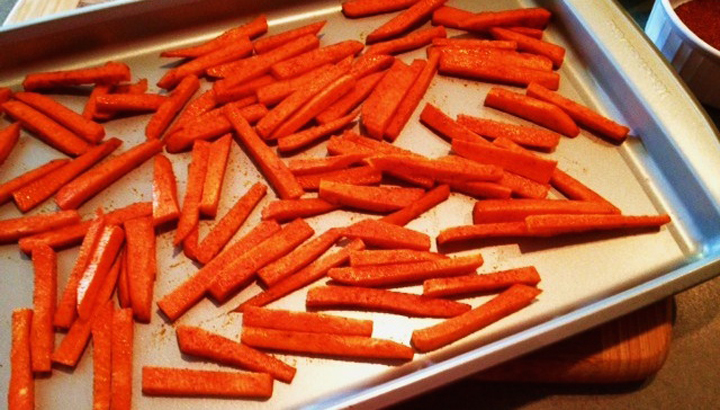 Arrange sweet potato sticks on two baking sheets, making sure to keep the potatoes separate. Bake in the oven for about 15 minutes, stirring fries carefully halfway through. Bake until the fries are lightly browned. Remove fries from the oven and allow them to sit on the pan for 5 minutes. Note: Sweet potatoes fries are generally not crisp, but should still be firm on the outside and tender on the inside. To make the dipping sauce, mix the yogurt, mayonnaise and spices together in a small bowl. Serve with fries. Enjoy! 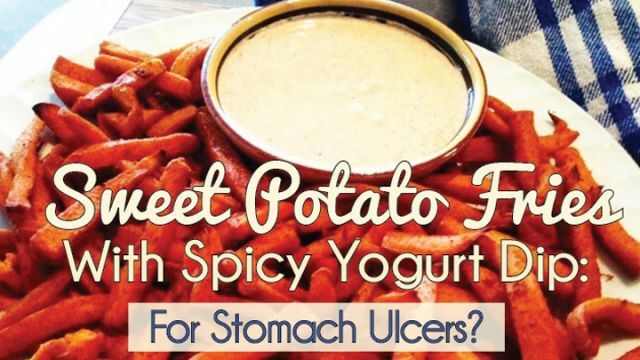 Hey Buddy!, I found this information for you: "Sweet Potato Fries With Spicy Yogurt Dip: For Stomach Ulcers?". 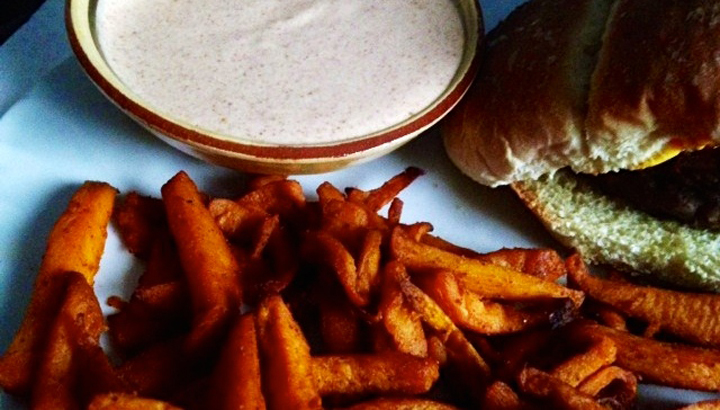 Here is the website link: https://www.thealternativedaily.com/sweet-potato-fries-with-spicy-yogurt-dip-for-stomach-ulcers/. Thank you.